I was asked to pen a piece for Black History Month for Latino Connection Magazine. 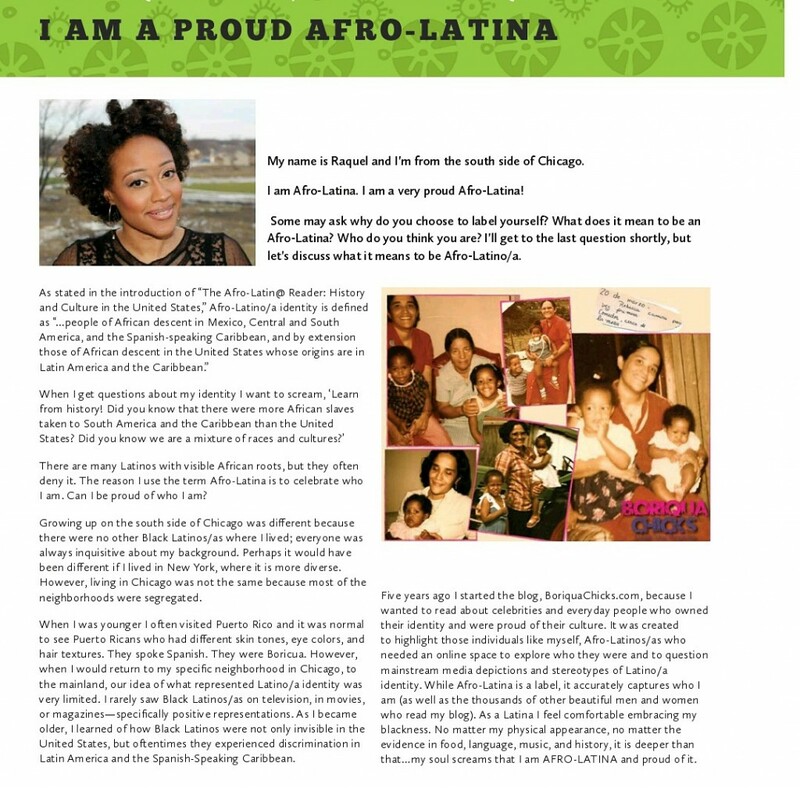 In this article (printed in Spanish & English), “Soy Una Orgullosa Afro-Latina,” I explain why I am proud of my roots. I thought it was important to make this essay personal because I always get questions about identity and why it’s important to me. Is identity important to you? Why do choose to identify the way you do? 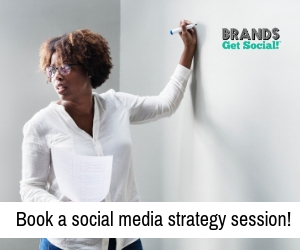 Let us know in the comments section or connect on social media! Check out my piece below. My name is Raquel and I’m from the south side of Chicago. I am a very proud Afro-Latina! Some may ask why do you choose to label yourself? What does it mean to be an Afro-Latina? Who do you think you are? I’ll get to the last question shortly, but let’s discuss what it means to be Afro-Latino/a. There are many Latinos with visible African roots, but they often deny it. The reason I use the term Afro-Latina is to celebrate who I am. Can I be proud of who I am? This article was originally published in Latino Connection Magazine. Thank you to them for including this important discussion in their publication. Growing up on the south side of Chicago was different because there were no other Black Latinos/as where I lived; everyone was always inquisitive about my background. Perhaps it would have been different if I lived in New York, where it is more diverse. However, living in Chicago was not the same because most of the neighborhoods were segregated. When I was younger I often visited Puerto Rico and it was normal to see Puerto Ricans who had different skin tones, eye colors, and hair textures. They spoke Spanish. They were Boricua. However, when I would return to my specific neighborhood in Chicago, to the mainland, our idea of what represented Latino/a identity was very limited. I rarely saw Black Latinos/as on television, in movies, or magazines—specifically positive representations. As I became older, I learned of how Black Latinos were not only invisible in the United States, but oftentimes they experienced discrimination in Latin America and the Spanish-Speaking Caribbean. 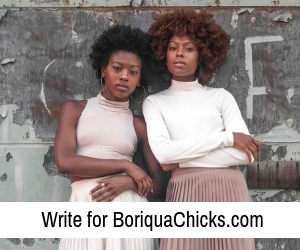 5 years ago I started the blog, BoriquaChicks.com, because I wanted to read about celebrities and everyday people who owned their identity and were proud of their culture. It was created to highlight those individuals like myself, Afro-Latinos/as who needed an online space to explore who they were and to question mainstream media depictions and stereotypes of Latino/a identity. While Afro-Latina is a label, it accurately captures who I am (as well as the thousands of other beautiful men and women who read my blog). As a Latina I feel comfortable embracing my blackness. No matter my physical appearance, no matter the evidence in food, language, music, and history, it is deeper than that…my soul screams that I am AFRO-LATINA and proud of it. I’m a Blackman I love love love love love afrolatinas soooooo much. My mom shared your posts with me and I decided to check out your page. This is wonderfully positive and I can’t wait to share it with my little one so she can be proud of her black and Puertorican heritage too! Thank you so much for so much for this I’m also Afro-Puerto Rican and I take pride in it. My mother is from Ethiopia and my dads family is from Puerto Rico. People never realize that I’m Latino because I’m black and when I explain that I am they then say I’m not black I’m Latino. I’m so glad someone has actually taken the time to enlighten people about what it means to have African roots in not only Latin America and the Caribbean but the entire world. ¡¡GRACIAS!! 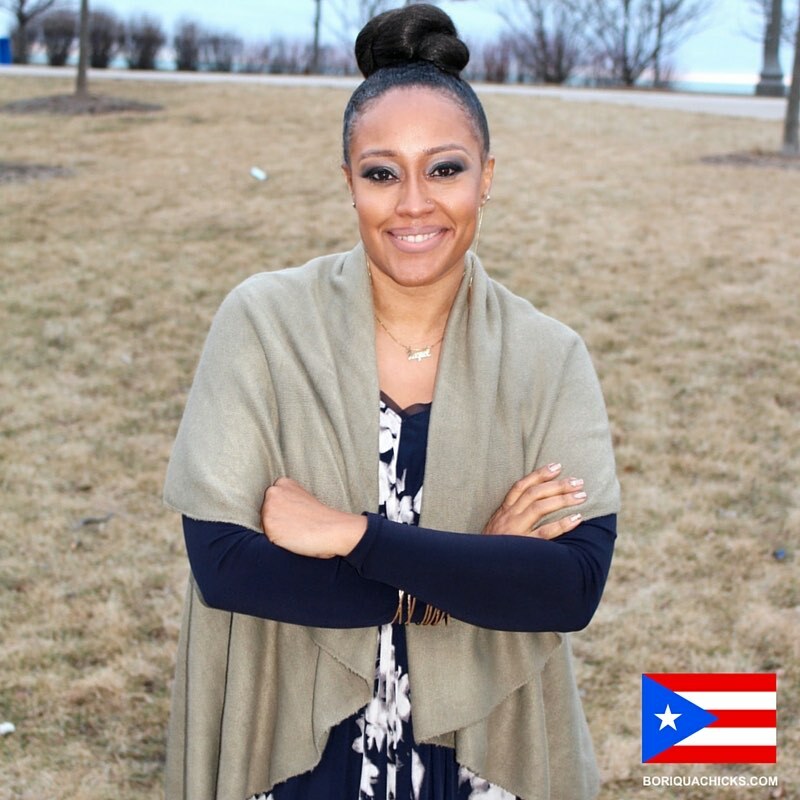 I am a black, Puerto Rican woman. I am a VERY proud Afro-Boricua/Afro-Latina. Thank you Raquel; you said it beautifully! Hello, I just recently started following your blog and I’m loving it!! My Afro-Latina heritage is so much of who I am as a person, and to see an internet space celebrating our people is absolutely wonderful. Thank you for what you’re doing. I love afrolatinas sooo much your loyalty is everything to me. From one Unapologetically AfroLatina to another, thank you for your blog.